In 1990, Terry Smith at age 37, purchased a single location collision repair business called Boyd Autobody in Winnipeg, Manitoba. Over the next few years he would acquire several other locations and in 1998 publicly list the company on the Winnepeg Stock Exchange as the first publicly traded collision-repair business in North America. Today, Boyd Group operates ~400 collision repair centers across North America in addition to overseeing thousands of affiliated retail-glass and emergency road side service locations. The Boyd Group trades under the name, Boyd Group Income Fund (TSX:BYD.UN), and is the best performing stock in Canada over the last 10 years. 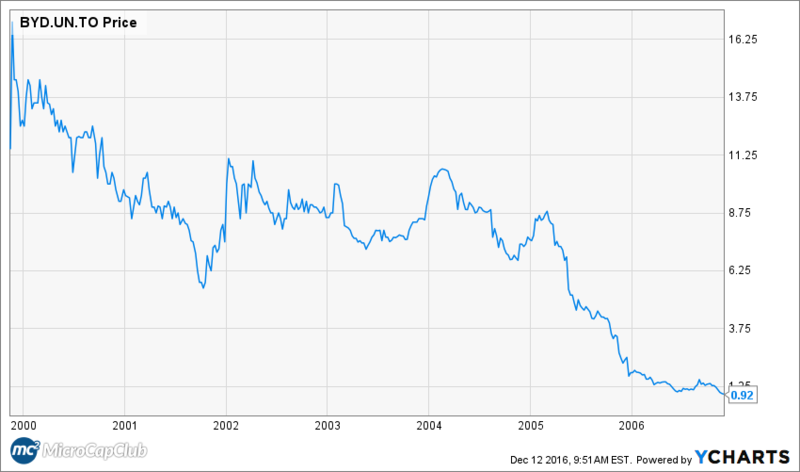 In 2006, Boyd Group was a $1 per share, $10 million market cap microcap, and today it is a $84 per share $1.5 billion market cap smallcap. Shareholders that were lucky and skillful enough to buy and hold Boyd Group during this ten-year period have realized a veracious 55.7% CAGR (80-Bagger). We will now take a deeper dive into the story of Boyd Group and its intelligent fanatic founder Terry Smith, and his long-time business partner (now CEO) Brock Bulbuck. Terry Smith was an investor at a young age having invested in a restaurant chain called Clancy’s. Smith likely learned the art of risk taking from his father. At the age of 62, Terry Smith’s father sold his house in Vancouver to go into business. The business was Docksteader Collision Centre. Terry would invest alongside his father in this venture. He studied the business and liked what he saw. With over 1,200 autobody shops in Manitoba alone, he saw a consolidation opportunity. He also liked the payer dynamic since insurance companies were the payer in 75%+ of repair cases. He needed money to take advantage of this opportunity, so he formed Cross Canada Collision Centres Limited Partnership to raise capital. Terry was the consummate salesman and had no issues raising money. Due to Manitoba Security Commission rules he had 180 days to raise capital, and he successfully raised $1.5 million (150 units at $10,000 each). Over a subsequent 180-day period, he raised an additional $1.5 million. All in, Terry Smith was able to raise $4 million for Cross Canada Collision Centres Limited Partnership from 325 limited partners. He now had a war chest of cash to execute his grand vision of becoming of a dominant multi-shop collision repair operator (MSO). On November 1st, 1990, after six months of negotiation he paid $100,000 for Boyd Autobody. He now had his first repair center, and it wouldn’t be the last. Good service, clean locations, and effective mass marketing created a perfect recipe for happy customers and growth. In fact, roughly half of Boyd’s new customers in the mid-late 1990’s came from customer referrals. The company also found they could add significant value to acquired locations by providing diligent financial management, strategic planning, and bulk purchasing. In January 1993, Terry’s long-time friend Brock Bulbuck joined the company to help him expand operations. Brock would be Terry’s right hand man taking on a variety of roles including: Vice President, Senior Vice President, CFO, President & COO, and finally taking over as CEO in 2010. Smith said this of his close friend and business partner, “He is a man of the highest integrity and the smartest man I have ever met”. In 1997, The Boyd Group Inc. was formed to acquire the Limited Partnership to facilitate a public stock exchange listing. On February 9, 1998, approximately 6.1 million shares were listed on the Winnipeg Stock Exchange and Boyd Group became the first and only publicly traded collision repair company in North America. [In 1999, the company would upgrade its listing to the Toronto Stock Exchange]. The company raised an additional $4.5 million of growth capital, and by the end of 1998 the company had 32 locations, including its first locations in the United States. Most intelligent fanatics look to run decentralized organizations that decrease management layers and increase employee autonomy. Companies with strong leadership that focus on maintaining a culture will win in the long-term. In 1995, 1996, and 1997, Boyd Group was recognized by the Financial Post and Arthur Anderson as one of Canada’s 50 best managed companies. A commitment to Innovation and Continuous Improvement. Other differentiating factors that set Boyd Group apart from the everyday Mom and Pop autobody shops was Terry Smith and Brock Bulbuck’s relentless dedication to customer service and quality control. Boyd Group hired an external firm to set up Customer Satisfaction Indexing (CSI), a mechanism to randomly survey customers and provide an assessment to managers. Store managers and senior management were compensated based in part on the basis of their CSI performance. In 1999, Boyd’s King Edward location in Winnipeg was the first collision repair center in North America to earn ISO 9002 registration. The company then developed plans to introduce and develop the ISO program in all of its locations and by the end of 2000, 32 locations achieved ISO 9002 certification. Around this same time the company launched its Common Branding Strategy to rename acquired units to achieve the benefits of having one common name. In Greek mythology, the Sirens were dangerous mermaid like creatures whose seductive music would lure sailors to their doom. Terry Smith was not immune to the siren song of growth. In 2000, when the company was on a $100 million revenue run rate, Terry Smith made a bold projection. He proclaimed that the company would hit $500 million in sales and $1 per share in earnings by 2004. He was wrong. In addition, in 2002, the board evaluated converting the company into an income fund for tax purposes. In 2003, shareholder approved the conversion renaming the parent company Boyd Group Income Fund and sold 1 million trust units in an IPO on the Toronto Stock Exchange. The fund would make monthly cash distributions to the “maximum extent possible”. In the early 2000’s, expansion into the US proved harder than previously thought and they had to shut down a few locations due to lack of performance. The United States was still a huge opportunity for Boyd Group. They just needed to attack it differently. Instead of buying single units, they decided to focus on acquiring a larger best in class collision repair chain. In February 2004, they acquired Gerber Group and its 16 repair facilities in the greater Chicago area. Gerber Group was a large acquisition at roughly half the size of Boyd Group. Boyd would then rebrand all their remaining US locations under this one brand, Gerber Collision & Glass. During this time, the North American auto collision repair industry was weakening, and combined with a strong Canadian dollar, the effects were seen in Boyd Group’s financial performance. The company funded its acquisition strategy mainly through a credit facility and stock issuances. Financial performance was lagging and the company was paying out a bulk of its operating cash flow in monthly distributions. 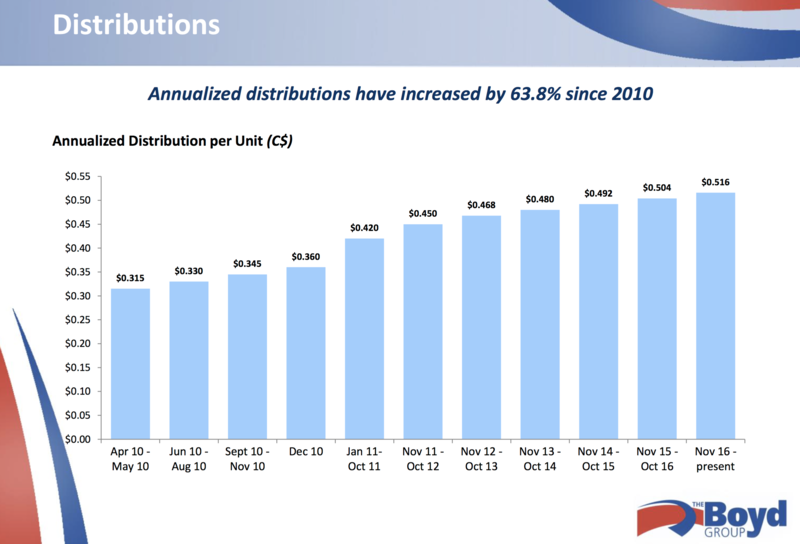 In early 2005 the company started reducing the monthly distributions and by late 2005 the board made the hard decision to temporarily suspend monthly distributions. In 2006 they took a $17.8 million non-cash write down of goodwill. Investors punished the stock below $1 per share. In 2007, the macro and currency headwinds started to neutralize and the hard, laborious work put into the US strategy started to show in the financials. US same store sales were up almost 6% in 2007. Insurance companies also stepped up giving Boyd commitments of $7.5 – 20 million per year of additional business. The company paid down more debt, and by YE 2007 they reinstituted a sustainable monthly distribution. The board would modify the distribution based on current and prospective performance of the business with the goal of increasing it over time. Great allocators know when to use their stock as currency and when to eat themselves. With the stock at all-time lows and the business turning positive, it was time to eat themselves. On October 15, 2007, the company announced a Normal Course Issuer Bid (Canadian for “Buy Back”) and bought back 90,900 shares ($2.60 average price) in 2007, 565,900 shares ($2.72 average price) in 2008, 338,000 shares ($3.50 average price) in 2009. From October 2007 to December 2009, the company repurchased ~9% of their outstanding shares. In 2009, Terry Smith was seriously injured in a snowmobile accident, and it immobilized him for six months. In his absence, Brock Bulbuck and management stepped in and the company didn’t skip a beat. When Terry finally recovered, he felt it was time to hand over the reins, so in January of 2010, Terry Smith stepped down as CEO, and Brock Bulbuck stepped in. From 2006 until mid-2010 the company made no large MSO acquisitions, opening 6-8-10 new locations per year under the Gerber and Boyd brands. On June 28th, 2010, they fired their elephant gun and bought True2Form Collision Repair Centers (37 Centers), one of the largest multi-location collision repair center companies in the United States with locations in North Carolina, Ohio, Maryland, and Pennsylvania. On June 30, 2011, they acquired Cars Collision Center and their 14 locations in Illinois, 8 locations in Indiana, and 6 locations in Colorado. On January 3, 2012, they acquired Master Collision Repair and their 8 locations in Florida. On July 3, 2012, they acquired Pearl Auto Body and their 6 locations in Colorado. On November 16, 2012, they acquired The Recovery Room and their 11 locations in Florida. On November 30, 2012, they acquired Ellice Hopkins, Timron Holdings, and S&L Auto Glass and their 14 locations in Florida. On May 31, 2013, they acquired Glass America and their 23 locations. On September 3, 2013, they acquired Hansen Collision and their 25 repair centers. On April 14, 2014, they acquired Collision Revision and their 25 centers in Illinois, Indiana, and Florida. ON June 6, 2014, they acquired Collex Collision Experts and their 16 centers in Florida and Michigan. On September 12, 2014, they acquired Champ’s and their 7 centers in Louisiana. On January 2, 2015, they acquired Craftmaster Auto Body and their 6 locations in Florida. On March 21, 2016, they acquired J&M and their 5 locations in Oregon. The amount of large MSO acquisitions above may seem aggressive, but Boyd Group is very strategic and disciplined in their strategy. Boyd won’t acquire MSOs if they don’t meet certain return hurdle rates. So in periods of high deal competition, like in 2015 and 2016, you won’t see Boyd acquire many large MSOs. In fact they adapted their strategy the last couple years to be able to do more single shop acquisitions where there is almost never any deal competition. They will usually do a large acquisition to enter a new territory, then they will add single locations around that area. They usually spend around $500,000 for single locations and make 25% EBITDA ROIC after a 12-24-month period where they get revenue synergies from insurers that redirect traffic to their newly acquired location and also from productivity enhancement. If you can reduce repair cycle times you can increase productivity, customer satisfaction, and same store sales growth. The US industry average repair cycle time for MSO’s is 10.5 – 12 days. Boyd was averaging 2 days faster than the average, but they weren’t happy with this. Starting in 2013, Boyd spent 18 months and $3.5 million working with consultants developing a system to reduce their repair cycle times to 5-7 days. They called the system the “WOW Operating Way”. The company has been slowly implementing the WOW Operating Way across all its facilities. In 2010, the tax advantages of being organized as a Fund extinguished. The board evaluated a reorganization into a corporation, but after a thorough investigation they concluded it was in the unit holders best interest to remain a Fund. Boyd Group has consistently increased its monthly distributions to unitholders. In 1990, Terry Smith had a vision of becoming a dominant MSO in North America. He succeeded with the help of Brock Bulbuck and many other capable managers and employees. The company’s success has attracted other financial institutions to the MSO consolidation story. There are four big consolidators. Boyd is one, and the other three are owned by private equity funds. 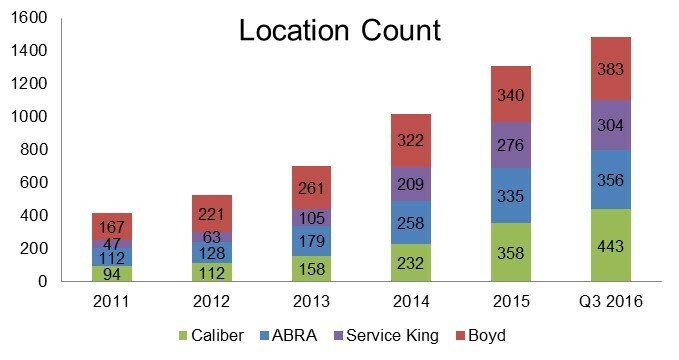 Today, Boyd Group is still the only public company in the auto collision repair industry. Perhaps the most interesting thing is Boyd Group only has a 3.7% market share of its addressable market, and the most exciting thing is Boyd Group is still a relatively small $1.5 billion market cap smallcap. In late 2015, the company announced they expect to double their revenues in five years (implied 15% growth). 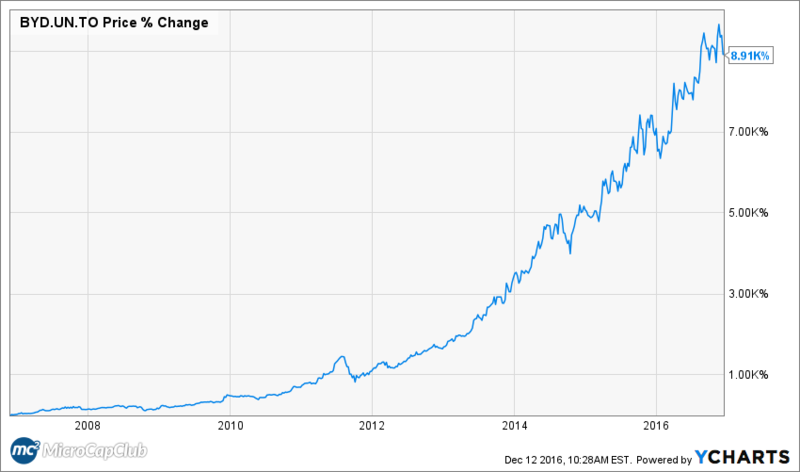 If you look at Boyd Group’s stock chart in the beginning of the article (2006 – Present), it’s easy to assume the company’s success was immediate, obvious, with linear up and to the right results. But reality kicks in when you view the previous eight years (1998-2006) of hardship. It is tremendously difficult to scale a business from nothing to $1 billion in revenues without growing pains along the way. A commonality in all intelligent fanatics and great companies is perseverance. Almost all successful people and companies at some point went through incredible hardship, obstacles, and challenges. The power to endure is the winner’s quality. If you enjoyed this article, I know you will enjoy reading our new book: The Intelligent Fanatics Project: How Great Leaders Build Sustainable Businesses. *I want to thank a couple of our members, who wish to remain anonymous, for helping me write this article. I visited collision repair shops often, especially during initial years in the US..:-) Now I reflect back on those years, these were a good business, don’t recall any repair shop not having enough work, big or small..from West Coast to East Coast, even the ones with pathetic service. If you improve the customer experience, shorten delivery period plus few other things.. it can definitely be scaled up..especially in US, Canada, there will always be demand for automobiles. Thank you Vikas for the comment. Appreciated. Brock shared this with me today. An interesting and accurate “romp through time”. And, yes it was certainly a group effort. So nice to do a good job for those original 325 entrepreneurial LP’s that put their hard earned $ where my mouth was back in the early 90’s When I watch the TV shows Dragon’s Den and Shark Tank, I often wonder what they would have said about the idea. Thanks for commenting Terry. A few of our Canadian members own it (one has owned it since $1.50/share), and they provided me with some good details on the business and history. Congratulations on the success. Excellent article Ian! Enjoyed how you connected the dots of the history of the company through the up & downs. Definitely encouraging that’s for sure. Thanks Sean, I’m glad you gained value from it.